Season 17 of the hit long-running Fox animated comedy. Back in 2005, it seemed amazing that The Simpsons lasted all the way to its 17th season. As I write this in fall 2017, the series now finds itself in Season 29, with no end in sight. Without further ado, let’s look back all the way to S17. As always, I’ll look at the shows in their original broadcast order, which is how they show up in the set. The plot capsules come straight from the package’s booklet. “Bonfire” regurgitates themes from earlier episodes, though it does so in a self-aware manner, which gives it some juice. Some of this veers toward self-parody, but we get a decent smattering of laughs in this satisfactory season opener. Like “Bonfire”, “Slept” lacks a lot of inspiration. Like “Bonfire”, though, it still manages to toss out some good gags, enough to make it fairly entertaining. The Kirk/Luann breakup offered a rare character change that stuck – usually Simpsons undoes that kind of plot twist. The return to that thread offers a few engaging story elements, and “Sand” brings out another moderately amusing episode. The annual Halloween show often acts as a highlight, and “XVI” works pretty well. While not among the series’ best “Treehouse” episodes, it comes with enough cleverness to succeed. So far, Season 17 displays a distinct trend. It does nothing new, really, but it still gives us enjoyable shows. I do like the twist when Marge recognizes the changes she wrought in Bart, though. Hmm… a political campaign goes out of control and potentially leads to the election of a loudmouthed, unqualified candidate – that could never happen, right? Foreshadowing to 2016 aside, “Run” works pretty well. To be sure, it goes on some interesting tangents and offers a clever episode. It’s not a classic, but it amuses. Wow – Mayor Quimby’s wife plays a role in two straight episodes! Is that good or bad? Neither, probably, but it’s a curiosity. Parts of “Mamas” work well, but the plot twist related to the Tomatoes sends the episode off the rails. Still, it’s a decent show despite the missteps. Some of the series’ greatest episodes involved Bob. “Italian” doesn’t live up to those heights, but it manages to mostly work well. Throw in a prescient comparison between Mussolini and Donald Trump to wrap up the bow on this show. Like most Simpsons anthologies, “Stories” varies. To my surprise, the Bible part fares best, while the other two seem spottier. “Coot” feels like an episode heavy on concept and light on execution. While it generates a smattering of laughs, it seems as though the writers figured the concept would carry it and they forgot to do much more than that. S17 rebounds with the solid “Road”. The Bart/Homer part scores, and Marge’s yard sale offers laughs, too. This turns into one of the year’s stronger shows. “Laddy” starts well, as the combination of Homer’s lack of pants and the new gym coach delight. Once we hit the main My Fair Lady-based plot, though, the show becomes less consistent. Still, it comes with enough charms to keep us with it. Essentially a version of the anthology show, “Story” manages a clever approach to the genre. It plays fast and loose with the characters and gags, most of which amuse. While they would get stale in large doses, a little Rod and Todd delights, so those aspects of “Mommies” turns positive. The Bart subplot seems less compelling, though. While guest star Ricky Gervais adds some spice to the proceedings, “Wife” mostly seems average. It still churns out some good laughs, but it’s not a great episode. Geez, S17 seems preoccupied with suicide! Prior episodes got into Moe’s intentions to kill himself, and now Grampa goes the same way. As for the rest of the episode, it seems to exist to make a point about bullfighting. While I agree with its anti-bullfighting premise, it doesn’t make for great comedy. In theory, the episode’s plots should work well, as “Bang” adds Patty and Selma’s MacGyver exploits, too. Unfortunately, neither thread really prospers – they have a few good moments but feel lackluster overall. Another anthology, and an inconsistent one at that. We get a handful of laughs but not a lot of inspiration. As someone who works in education, I like the series’ pokes at various flawed theories. That side of the show does pretty well, as do Skinner’s desperate attempts to be politically correct. It’s not a great show, but it offers a decent bounce back after a few meh episodes. Every once in a while, the series goes sweet and sentimental, and “Margie” provides that experience. It seems surprisingly genuine and also has enough laughs to become a pretty good show. Like many Lisa-based episodes, “Suit” proves to be fairly preachy. As with the bullfighting show, I agree with its ideas but the program tends toward heavy-handed material. S17 ends with a decent episode. Like much of S17, “Couple” delivers a reasonable array of laughs, but it never quite excels. Still, it becomes a fairly positive conclusion to the year. The Simpsons appears in an aspect ratio of approximately 1.33:1 on this Blu-ray Disc. These became attractive shows. Overall sharpness remained positive. Some issues related to the original animation caused a little softness, but in general, the episodes seemed tight and concise. No signs of jagged edges or moiré effects materialized, and I saw no edge haloes. Source flaws also failed to appear. Colors appeared pretty peppy. The series went with a broad palette and gave the shows nice, lively hues. Blacks were deep and tight, while shadows seemed smooth and appropriately visible. The episodes offered pleasing visuals. As usual, the series’ DTS-HD MA 5.1 audio remained restrained but effective. Music demonstrated nice stereo presence, while effects offered a bit of breadth, as they opened up general environment in a reasonable way. Nothing especially impressive occurred, but the effects worked fine for the material. Quality appeared positive, with speech that consistently came across as natural and distinctive. Music was full and rich, and effects appeared accurate and tight. Though the audio never dazzled, the mixes worked fine for the shows. As usual, every episode comes with an audio commentary. 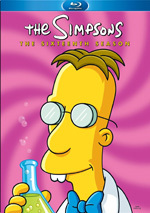 Show runner Al Jean appears on all of the tracks, and executive producer Matt Selman comes along for each one other than “See Homer Run”. After that, we get a revolving roster. We find writers Dan Greaney (episodes 1, 19), John Frink (2, 8, 13, 17), Patric M. Verrone (3), J. Stewart Burns (3, 9, 21), Marc Wilmore (4, 7, 8, 11, 20, 21, 22), Stephanie Gillis (6), Joel H. Cohen (7, 10, 22), and Deb Lacusta (17), executive producer Ian Maxtone-Graham (8, 13, 17), producers Tom Gammill (1, 4, 5, 6, 8, 12, 15, 16, 17, 18, 19), Max Pross (1, 2, 5, 6, 12, 15, 16, 18, 19, 20, 21), and David Silverman (1, 2, 4, 5, 6, 7, 8, 10, 11, 12, 13, 14, 15, 16, 17, 18, 19, 22), co-executive producers Tim Long (3, 7, 9, 16, 20, 21, 22), Dana Gould (10), Michael Price (2, 3, 9, 12, 13, 16), Caroline Omine (12, 16), and Kevin Curran (3, 4, 9, 11), co-producer Jeff Westbrook (5, 7, 22), directors Nancy Kruse (1, 19), Raymond S. Persi (2, 13, 20), Mike B. Anderson (5, 10, 14), Steven Dean Moore (3, 9, 12, 16) and Mark Kirkland (1, 17, 19), animation director Mike Marcantel (10, 14), writer/actor Richy Gervais (15), and actors Dan Castellaneta (4, 8, 11, 17), Tress MacNeille (7), Kelsey Grammer (8), Richard Dean Anderson (17) and Michael York (10, 14). Fans who listened to prior seasons’ commentaries will know what to expect here. We get a mix of notes about story choices, inspirations, technical areas, performances and related areas. As usual, the commentaries remain fairly mediocre. We get a decent array of observations but the tracks often devolve into general laughter and appreciation for the episodes. Probably the best of the bunch comes from “Homer Simpson, This Is Your Wife”, and that’s entirely due to the infectious energy of Gervais. MacNeille adds pizzazz to “Last of the Red Hat Mamas” as well, a reminder that these tracks work better with actors who show personality – that’s what carried the Futurama discussions. Fans will still get something from the chats, but they’re generally mediocre. Through the discs, we find 21 Deleted Scenes. These accompany every episode except “Marge’s Son Poisoning”, “The Italian Bob”, “My Fair Laddy”, “The Seemingly Neverending Story”, “Girls Just Want to Have Sums” and “Regarding Margie”. All together, these run a total of 11 minutes, 41 seconds. Brief extensions to existing scenes, these offer a smattering of laughs but nothing consequential. 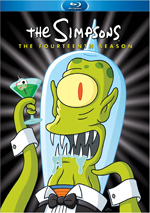 We can watch the deleted scenes with or without commentary from Al Jean and various writers. They mostly just chuckle, so they tell us little of use. Sketch Galleries show up on Discs One and Two. Disc One’s collection runs three minutes, 21 seconds, while Disc Two’s goes for three minutes, 20 seconds. Both let us see various character designs, and they’re nice glimpses of the art. On Disc One, we get an introduction from creator Matt Groening. In this three-minute, 47-second clip, Groening offers the usual look at the season and preview of the package’s contents. I’ve always thought these intros seemed pointless, but they’re also harmless. An Animated Showcase appears for “The Girl Who Slept Too Little”. This allows us to use the “angle” feature to check out some scenes at different levels of completion, as we can flip between storyboards and animatics. The final product appears in a small box down in the lower right corner. This remains a fun way to inspect the different stages of animation. Taken from Season One, we get a bonus episode of The Simpsons. “Krusty Gets Busted” offers one of the better early shows. The Great Ones lasts 22 minutes, two seconds. It presents a montage of opening credits and “couch gags”. This becomes a good way to see a mix of these from over the years. 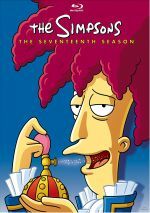 Another bonus episode pops up on Disc Two: “Cape Feare” from Season Five. It’s a classic. Within the Special Language Feature on Disc Two, we get the same kind of multi-language clip we’ve found on prior sets. We can watch all of “Homer Simpson, This Is Your Wife” in Ukrainian, Hungarian, German or Italian. It’s a cute option but not terribly useful. Yet another bonus episode comes to us on Disc Three: “The Man Who Grew Too Much” from Season 25. Like Season 17, it comes with some laughs but doesn’t match up with the series’ best. We find a table read with Live! It’s The Simpsons. It goes for 34 minutes, 55 seconds and amasses cast/crew to go through “The Italian Bob”. It’s an entertaining way to hear the run-through for the script – though unfortunately, it lacks video, so we don’t see the participants at work. Finally, Let There Be Music runs five minutes, seven seconds and shows a recording session for the series’ music along with comments from composer Alf Clausen. We don’t get a lot of substance, but a few decent tidbits emerge. The package also includes a booklet. It presents episode overviews/credits with an intro from Groening and some art. As usual, the booklet completes the set well. 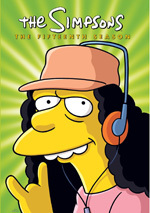 A generally positive package of shows Season 17 of The Simpsons won’t eliminate memories of the series’ “glory years”. However, it tops the weaker seasons and turns into a mostly amusing collection of episodes. The Blu-ray offers very good picture with decent audio and supplements. Fans will enjoy S17.